The Trabant machine's kinematic arrangement is Revolute-Hinge-Revolute. 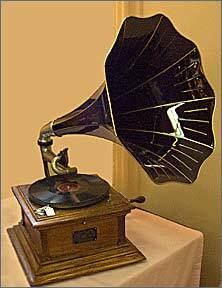 It can be thought of as a turntable riding on a horizontal hinge which is riding on another turntable. When the hinge is fully closed, the 2 turntables are coaxial (same center) and the existence of the hinge is hidden. The machine has 3 DC gearmotors, each with its own bidirectional controller. 2 sets of slip rings to pass electrical lines for motors and lamps through the 2 turntable axes. 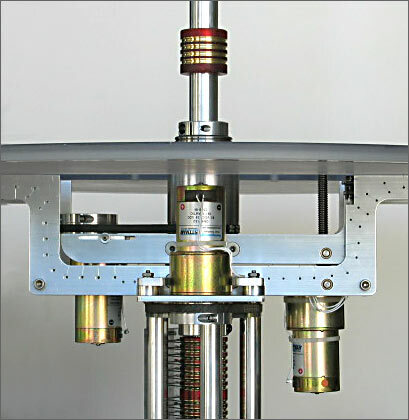 The 2 turntable axes are ball bearing mounted and connected to their motors via miniature V-belts. 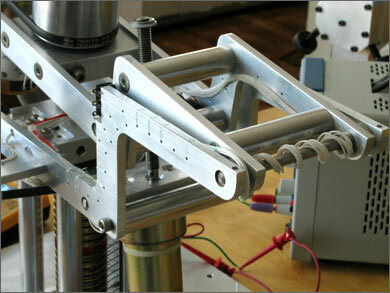 The hinge joint is powered by a simple power screw system. The machine and its 3 lighting circuits can run automatic routines or be manually controlled. The lower system produces a free-spinning verticle 1" hollow shaft containing wires. This shaft will support everything else. The lower system parts are shown far left, those parts assembled are shown at left. 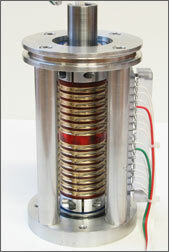 At the center of the system is a shaft / 15 line slip ring assembly. 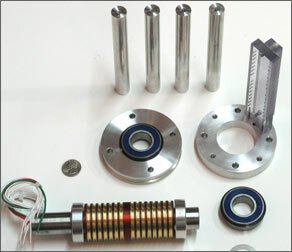 The shaft is supported by a pair of snap-ring ball bearings. A simple "column and deck" arrangement is employed. The bottom deck is attached to the base, and the top deck doubles as a V-belt pulley. The hinge system is fairly complex because it contains not only the powered hinge, but also the 3 gearmotors, wiring, limit switches and the join-plates to the 2 turntables. The power screw system uses a length of 3/8-16 stainless steel threaded rod directly attached to the gearmotor's shaft. This screw pushes a Delin "nut" attached to the upper leaf. Both the motor and the nut must be mounted so as to permit pivoting. The actual hinge pivots use a stainless steel shaft and press fit bronze bearings. 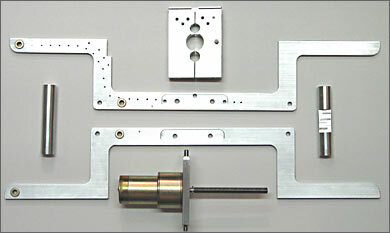 The control system must know when the hinge is fully up and fully down. 2 limit switches attached to the lower leaf serve this purpose. Care must be taken with the wiring to prevent pinching or fatigue failure at the pivot. the numerous little holes on the lower leaf are for wiring restraint. The helical wrapped wire bundle (visible right) can withstand repeated hinge actions. The lower platter is a 23" diameter disk of 3/8" polycarbonate. 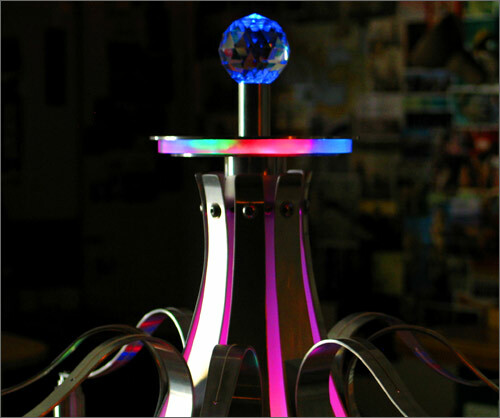 It has a groove milled into the underside in which 72 LEDs are embedded with color diffusing resin (photo right prior to resin pour). The platter is random sanded. It is attached to the lower hinge leaf and has a milled cutout which allows the upper leaf to pass. The canopy has 8 metal petals, spread out a bit to allow light from the center to be visible through 8 frosted diffusers petals. Making this form took some effort. The metal petals are made from .088" thick aluminum sheet. They were marked from templates, band sawn out, sanded smooth, then rolled to the designed curvature. 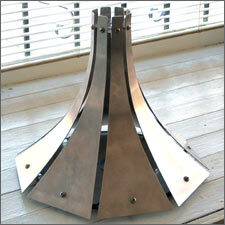 A series of 16 slanted standoffs secured the base of each metal petal and diffuser (diffusers not present in these photos). 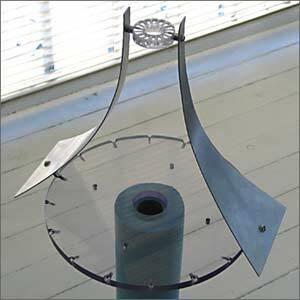 The tops were held verticle by another set of standoffs attached to a polycarbonate ring. 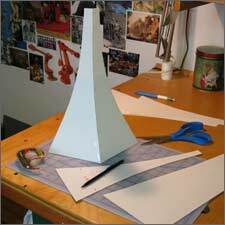 Making a "looks like" test out of paper. 8 identical panels get taped together. 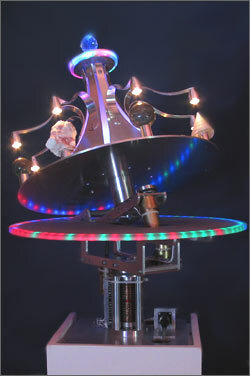 In this photo, some petals are off so the upper slip ring system and core LEDs are visible. 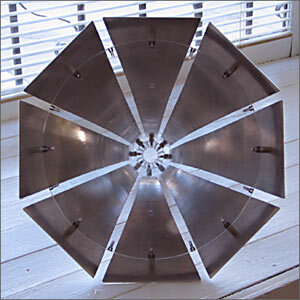 The central shaft and cap "stays still" with respect to the upper platter and canopy. Some thin lampholder petals have been installed. 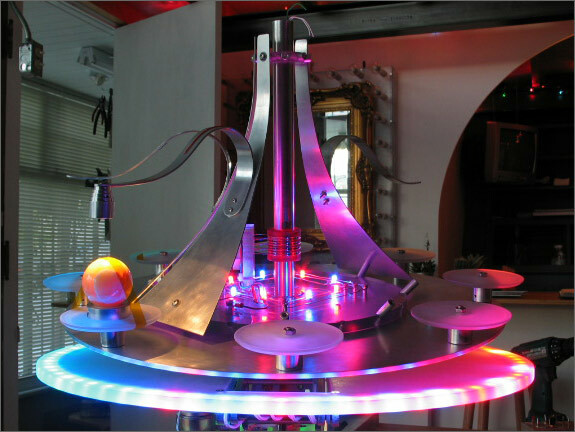 These lamps are bright incandescent bulbs with shades which shine on 8 positions on the upper platter.